Golden Cobra, the Indie RPG Awards, Game chef finalists, Brie Sheldon’s interviews, Jennifer Fuss’ Kickstarter roundups, Gerrit Reininghaus’ actual play of First Ride/Last Ride, Shane Liebling’s new online multi-user dice roller, a bundle of cheapish but valuable fonts, and Sophia Brandt’s Friday Grab Bag finds. In new and upcoming games we have Keith Stetson’s Seco Creek Vigilance Committee, Itras By: The Menagerie, and Eric Farmer’s Trash Pandas. Finally, Matthew Schmeer took it upon himself to collect all Lasers & Feelings hacks in one place, while an anonymous person made a politcal hack of Everyone is John: Everyone is Don. Ever wanted to design your own freeform LARP? Then you should probably enter this year’s Golden Cobra! Golden Cobra is a “friendly contest” running from August 1st to September 23rd 2017. There are four award categories: Games … that give hope, that non-gamers can understand and enjoy, with meaningful non-romantic relationships, that are really short (up to two pages). The judges will announce the winning games at Metatopia (2-5 November). To enter, you need to design an actual larp that has never been published anywhere (and no, it explicitly cannot be a tabletop RPG) and that shows it has been “developed” (tested and revised). Oh, you’re not sure if your game is a freeform larp? Well, the rules are pretty loose. Sitting somehwere between tabletop RPG and full larps, in a freeform larp you usually have to get up and move around at least some of the time. The Indie RPG Awards were created to celebrate independently published amall-press games released in English in the previous year. Their website has a tiny tiny font (wow, 10px is really not enough, people!) and is a little hard to navigate, but I think I found the correct link to the nominations for 2016. And I think you can still suggest games for nomination here. I mentioned the Game Chef design competition when it started a few weeks ago. Yesterday, the four finalists for the English version were announced. The final winners will be announced online on August 14th. Will Patterson’s Firelight: A post-apocalyptic game set in a near-future world where the sun has stopped coming up. It’s played around an actual campfire with a rotating GM role. Players play fictional versions of themselves and use pieces of yarn and a pair of scissors for action resolution. Pedro Ziviani’s - Once Upon a Full Moon: Players are mythological shape-shifting animals (“henge”) in 10th century Japan that help bring people who were meant to be together (again). The game uses standard playing cards, six-sided dice, a set of random classical Japanese poems, and half a meter of red yarn. Tim Hutchings’ Our Friends Over There: A freeform larp about how we see and describe other communities as different. It’s partly played like narrating a nature documentary. James and Elizabeth Iles’ - Weave: Players are novice magicians travelling through their world’s societies and exploring fabric, fashion, and how these Threadfolk societies value them. The characters also make their own garments embroidered with powerful gylphs that players record like an actual embroidery pattern in graph paper squares. In the “Five or so Questions” series on their blog “Thoughty”, +Brie Sheldon has been posting thoughtful interviews with RPG designers whose games are currently on Kickstarter. This week they talked to Ross Cowman and Mo Golden about their game Night Forest, which I mentioned on here last week. They also just spoke with Grant Howitt about Spire (from my roundup two weeks ago). For the near future, Brie has interviews on Legacy: Life Among the Ruins, and Seco Creek Vigilance Committee coming up. The first is already on Kickstarter (I mentioned it in my last roundup). Find out more about the latter below in the Kickstarter games section. You should probably subscribe to this G+ collection if you want to keep tabs on what’s on Kickstarter right now. 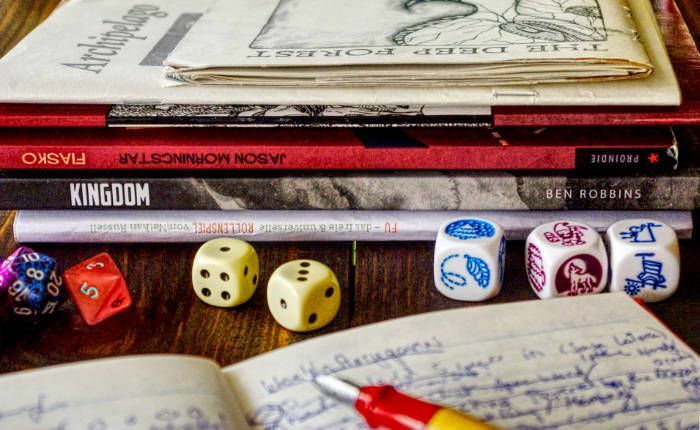 This is where +Jennifer Fuss announces her weekly roundups of anything RPG related on Kickstarter - dice, tokens, crunchy games, story games … She’s a superbacker who knows a thing or two about Kickstarter and always finds stuff that looks worthwhile. +Gerrit Reininghaus tried Jason Morningstar’s solitaire RPG “Last Ride/First Ride” and wrote an extensive play report for his blog. Take a look if you’re interested in the game! +Shane Liebling has coded a new online dice roller to use with your game group. Going to the URL https://rollforyour.party creates a new “room” and dynamic (kind of funny) URL that you can share with the other players in your Hangout (or Skype or whatever) game. They can all see what you rolled and what you do with the dice. Development is on Github, so you can add any bugs or suggestions into the issue tracker of the project there. Shane asks that you make a donation to Shanti Bavan Children’s Project if you find his roller useful. By the way, if this dice roller looks somewhat familiar to you, that’s no coincidence - Shane says his roller is heavily inspired by Graham Walmsley’s catchyourhare dice roller, which is broken at the moment. +Jason Pitre drew my attention to a bundle deal (29$) for a huge library of influential fonts that are usually way more expensive. If you self-publish games, scouring the Web for that one free font that looks almost like that other expensive one (but has terrible kerning, oh well) could be a thing of the past with this bundle. Especially if you need Futura, which is alone already more expensive than the whole bundle! The deal has about fours days left. Simplified versions of Dungeon World and a link to an early draft of DW itself. I never knew Tony Dowler was the one who originally started Dungeon World! a storygames.com thread drafting some collaborative design guidelines that include using Git version control and Markdown for your games. Side note: I already use both all the time for stuff like this and it’s invaluable; in fact I’m writing this very blog like this - the source markdown files live in a private repository at GitLab and are converted into a website by Hugo. 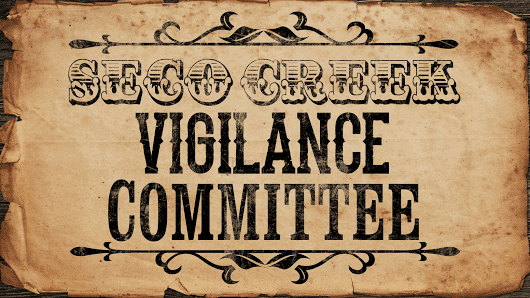 +Keith Stetson’s’ Seco Creek Vigilance Committee is an Old West RPG for one-shots that are all about hard choices between what’s right and what’s good. As far as I can tell, you play ready-made characters that are all members of a posse with a tightly woven web of relationships similar to Love in the Time of Seid or Lady Blackbird. Action resolution is diceless. Backing at any level (even 1 $) immediately gets you a quickstart in a backer-only update. 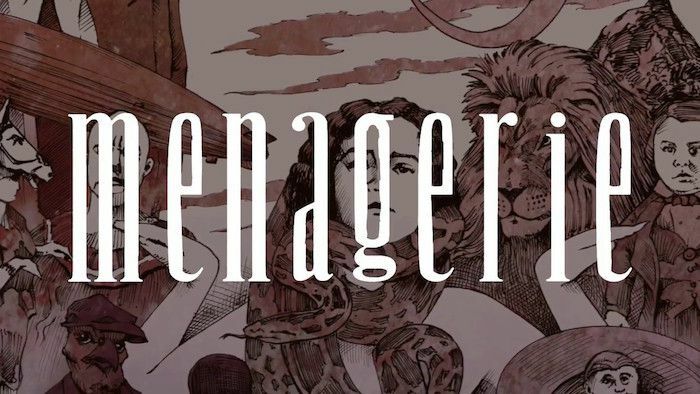 Vagrant Workshop has announced that their new supplement for Itras By, “The Menagerie” is almost done and will be available soon. Itras By: The Menagerie will contain plenty of new settings, ideas, scenarios and other helpful goodies for playing Ole Peder Giæver & Martin Bull Gudmundsen’s surreal game Itras By. An international team of 40 people were involved in creating the supplement. +Eric Farmer‘sTrash Pandas was a finalist in this year’s 200 Word RPG challenge. 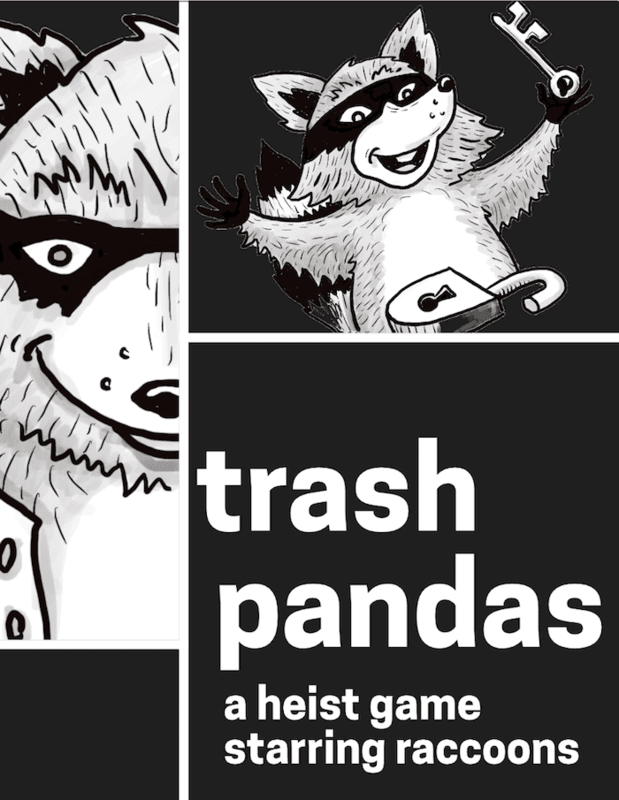 It’s a short lighthearted game for four players enacting a heist, but as silly scheming raccoons. The game has now been expanded and improved with art and put up for sale on DTRPG. Die deutsche Übersetzung von Freeform Universal (FU) ist fertig!